You need to look up for a website hosting company sometimes. For people who work with website research; a website that provides the hosting report is indeed a necessity. Even a casual internet surfer might want to check out a website’s hosting service out of curiosity or suspicion. Whatever the reason might be, these services have a remarkable amount of demand. 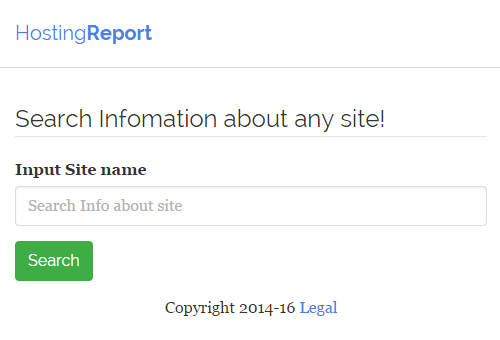 HostingReport.info is a website that provides precise and detailed information on websites you want to inspect. The service itself is free for use, there is no limitation or restriction for any given time period. The user interface is minimal at its best. The website is plain white, there’s just an address bar for website input and there are few buttons in bottom that shows the mostly searched websites. There’s only one button for legal information about the website, and that’s all. Even the most amateur user would be able to figure out how to use the service. Page speed and rank for precise judgment of popularity. IP address range for DNS servers. Initial directories and descriptions of the website e.g. favicon, title and description. Number of high quality and active backlinks. Availability of on-site SEO analysis like H1 & H2 tags, title tags, and meta information etc. When & where the domain had been registered. Owner of the website and their reputation. Domain uptime and expiration date. During our tests, the website performed pretty well. However, there are still many websites missing from the database but the developer team is really putting everything together to make this service best in the crowd. Fingers crossed for their efforts and quality service!